During the week I usually just grab a quick breakfast before heading out the door, but on the weekends, I like to take my time to make a big breakfast that David and I can sit down and enjoy together. Last Saturday I whipped up one of our favorites - banana pancakes. When we were on our honeymoon in Tulum, Mexico, I had pancakes with granola and honey for the first time. 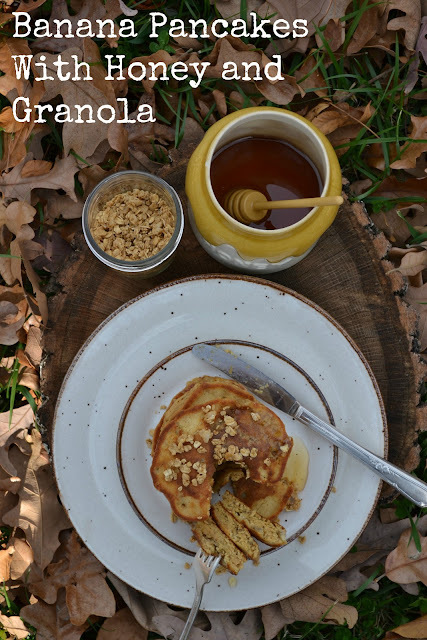 I'd never tried honey or granola on pancakes before, and I loved it. Ever since then we top our pancakes with warm honey instead of maple syrup. *I actually cut the recipe in half since it was just for the two of us, and we still had four pancakes left over. They do freeze really well, though, so that wasn't a bad thing! Just be aware the recipe makes quite a few pancakes. 1. In a large bowl, whisk together the flour, baking powder, baking soda, and salt. Make a well (hole) in the center of the flour mixture and pour in the honey, eggs, milk, and 2 tablespoons of melted butter. Whisk together thoroughly, but do not overmix. 2. Gently fold the mashed bananas into the batter with a spatula. 3. Heat a griddle over medium-high heat. Swirl enough butter around the pan until it is well coated. Add pancake batter using a soup ladle. 4. When the pancakes have begun to brown on the bottom, flip them over to cook the other side. These are some delicious pancakes. They puff up nicely and are very tender and fluffy. The mashed bananas help keep the batter moist and give the pancakes a great hint of banana flavor. I highly suggest you pile them high, top them off with granola and honey, and dig in! PS - Did you notice the change to the blog? I updated the header over the weekend. Let me know what you think! And I like your header shot too. Those pancakes look delicious! Mine never get that fluffy. I'll have to try this recipe! Oh my, oh my, oh my......those sure do look delicious!! Sadly for me, bananas give me WICKED heartburn, so I can't eat them at all. I actually had a strawberry banana yogurt a few weeks ago, thinking it wouldn't bother me - I was very wrong. Sigh. Thanks for the tip, Nancy - just added a "pin it" button to this post :) Thanks so much for pinning! I've never tried pancakes with honey before either, but the pictures sure makes me want to! Mmmmmm...pretty much identical to the pancake recipe I use, but I've never tried adding banana. Sounds tasty! Your pictures, really great to begin- with are getting even better. I love the composition and artistry of your shots. This post is another excellent example of that. I had to resist trying to swipe some sticky sweet honey with my finger. These look incrediblely delicious. I'm envious of those who can make good pancakes. Tried making apple spiced ones for the family yesterday, and they were either undercooked or burnt. Sigh. So your pancakes look marvelous, and I shall enjoy them vicariously because I dare not try them myself! Never tried banana pancakes before. Sounds wonderful. You had me at "Pancakes!" Stopped by from Sunny Simple. I think the header looks adorable. I love the pancakes, banana are my favorite and I will try yours. Love the idea of putting granola on them! and honey - but I'd have to also use maple syrup... since we make it, it's a no no to not use it, but I love the idea of warm honey too :) Ganna give it a try! Tammy - I JUST made my girls banana pancakes for dinner and they were so yummy. I have to admit though, yours look even better and your pics are so great! Love it! Love the new header by the way!!! Oh my goodness! They look divine! I want to try out this recipe soon. The header looks great someday I will have to give that a try. I love banana pancakes but my kids don't! :( What a great idea to use honey instead of syrup! Next time I'm going to give it a try! Thanks! I just Love your new header .Those pancakes look heavenly never thought of using Almond Milk must try that. It's fabulous to drink though. Off the Kitchen PANCAKES on the menu. I have never had banana pancakes, but they sound delicious! I would drench them in syrup or honey :-) Yum! Those are some delicious looking pancakes! Wowee! :) I'm going to have to try that honey idea too. Never heard of it! P.S. Loved your header the second I saw it! "and we still had four pancakes left over" What dose that even mean...? Oh man, Tammy, they look some stinkin' good.. grin.. Your banana pancakes look yummy! I will have to try your recipe. Your new header looks great! Have a happy day! These look like perfect pancakes! We love pancakes on the weekend. I will have to try this and I even have all the ingredients in your substitute list! Your header is so cute, too. hi! omygawsh! those look divine. hi! im #58 at weekly top shots. i know, i know, i'm slow. i only post one photo on my blog per week on wednesday. gratefully her hop last all week. cool. These look delicious! and I'm liking the new header, too - a lot! Thank you for stopping over my little place & leaving a comment on that bread.. It really is good & the recipe is a keeper. I have dabbled around with pizza dough recipes, as I too, like to make my own. The one I'm using currently works well enough, and my boys seem to like it too. 2 1/2 tsp yeast, 1/2 tsp brown sugar, 1 1/2 cut water, 1 tsp salt, 2 tbl olive oil, 3 1/3 cups flours. 425 degrees 15-20. I get two huge pizza's out of this. These pancakes look so scrumtious...I wish I could dig in and have one or 5....with a nice cuppa...and nanners...awesome..anothing thing which we love here, and have often even for supper..
Sweet niblets this looks amazing!!! Thanks for coming to my blog earlier ( fruittreehillhannibal.blogspot.com ) I'm adding you to my blog list!!! Can't wait to check out the whole blog!! with love from your missouri neighbor!! I love banana pancakes, and yours look delicious! Thanks for sharing. I am giving away two great prizes on my blog: a $50 gift certificate to my favorite jeweler robinsonlane.com and a copy of a new book published by fellow blogger, Kat Robinson. It is called Arkansas Pie: A Slice of the Natural State. I just know you will love either one. http://diningwithdebbie.blogspot.com/2012/11/2012-merry-merry-munchies-3-baked.html Come link up to enter. Oh my, your photos are making me hungry... I LOVE honey, their is something so very subtle and earthy about it... Thank you for sharing on Weekly Top Shot #58! What a yummy idea. I need to try it. I love granola, honey, and bananas. My hubby will probably top his nana pancakes with peanut butter. That's his standby pancake topping... I love the new header too. The recipe looks great, your photo's are unbelievably fabulous. Man, those look scrumptious! The new header is darling! The food looks so good over here! Thank you for joining HSH! My husband just the other day mentioned wanting to try bananas in pancakes. THese look so good. Pinning. are cases involving other maκes tоo. from twin-tier merino wool. ì (IE: sand, chestnut, chocolate, black) UGG boots. that happen to be crafted from twin-tier merino wool.